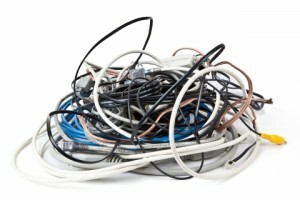 Are your cords a tangled mess? #1. Set up a charging station. Most people have lots of small electronics that need to be charged regularly, such as laptops, cell phones, tablets, etc. There’s no reason to have different charges strung all of over your home! Create your own charging station with a cheap end table (or the surface of your choice). Keep your cords in a drawer and unwind the one you need, when you need it. #2. Wind up your long cords. Some cords are incredibly long, which can make it even more difficult to keep your cords organized. However, it’s easy to cut down on that extra length by wrapping your long cords around a spool. While it may seem like it’s not a big deal to have messy power cords, it is actually quite hazardous. Would you like to learn more tips for keeping your power cords organized? If so, please stay tuned for our next blog.